When a dangerous-looking stranger raps on Lizzie Winstead's door one stormy night, the peace of her humdrum life is shattered. She's shocked to discover her visitor is Captain Edmond Grey, one of the most feared pirates of the realm and her lost love. Edmond is a wanted man throughout the Colonies, but despite his formidable reputation, he desperately needs help to nurse his wounded brother back to health. Only Lizzie can be trusted not to turn Edmond over to authorities for the price on his head. Is the love they once shared strong enough to reunite them forever and conquer the demons of Edmond's past? Sparks fly as the Duke of Goldstone and Lady Amelia find themselves at odds with each other and drawn to each other at the same time. Can they find a way to stop arguing long enough to explore their growing passion? The last thing Grace Rivers expects when she is sent to the country in disgrace is to receive a proposal from a handsome young army officer she hasn't seen in years. Captain Charles Everly's motive is far from romantic – his object is her inheritance: the beautiful country house that was his childhood home. As unexpected feelings develop between them, Grace's past and Charlie's rash actions throw everything they hold dear into peril. They must each decide which they value more: their childhood dreams, their damaged reputations, or their newfound love. Alys Dewitt has always dreamed of finding her very own happily-ever-after, but she never would have envisioned the path she'd have to fall down to find him. James Kendall, the Duke of Weston returns from war to find an injured woman on his estate. She mumbles strange phrases and keeps calling him by another name. Thinking her a bit mad from her wounds, he takes her to the manor and calls for a doctor. As days goes by they are drawn to each other. If they're brave enough they'll discover a love that defies time. When the life of his brother, the Duke of Elenford, is threatened, Lord Andrew Stephens must determine which of his enemies intends him harm. When Andrew takes the Duke's place at a masquerade ball, he meets a woman who takes his breath away and haunts his dreams. Arabella Marley's father gambled away their family's most precious heirloom and is determined she will gain it back for him, no matter the cost. He presents her to the man believed to be the Duke at a masquerade ball, and she is shocked to find him both handsome and agreeable. She must guard herself against his charms to find her family inheritance and keep her heart intact. Can Andrew and Arabella fight the love that grows between them, or will the truth be too much to overcome? Fleeing London, and scandal, Lady Clarissa Burton runs directly into the wife-hunting Earl of Dumfries while travelling on a rutted Scottish road. She wanted peace in Scotland, not a tall and brooding laird who makes her forget that handsome lords are nothing but trouble. 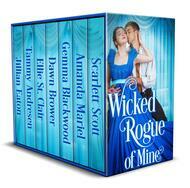 Rough and common, Aiden Donovan is the exact opposite of Evie's boring-as-lint fiance. But from the first moment they bump into one another on a crowded street, she finds herself utterly captivated by his dark roguish charm. As the day to her wedding draws closer, will Evie listen to her head? Or for the first time in her life will she risk everything to follow her heart?